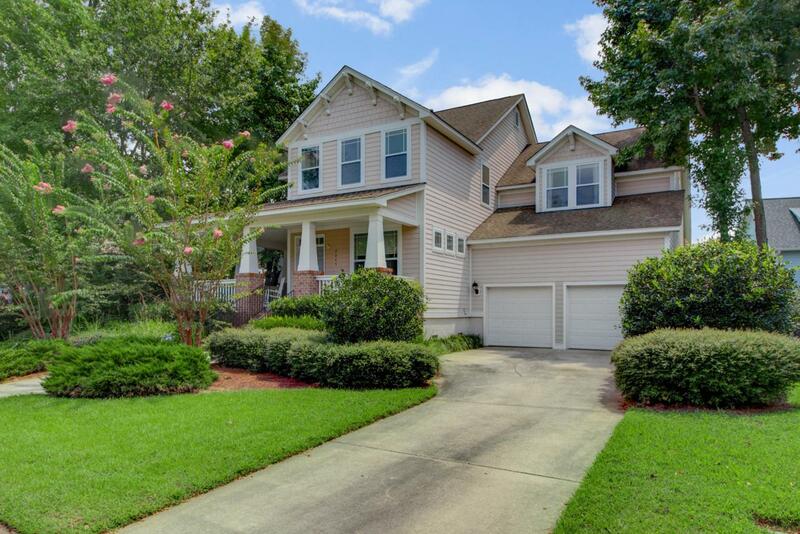 Welcome to this charming home located adjacent to Freedom Park on Daniel Island! Smythe Park, Daniel Island Elementary, the neighborhood pool and public library are all just a few steps away. Easily WALK or GOLF CART to EVERYTHING! The large, inviting front porch is perfect for enjoying a glass of lemonade on long summer afternoons. As soon as you walk inside, you'll notice the attention to detail. The soaring foyer, gleaming hardwood floors, and expansive windows illuminate the space. This home simply glows with natural light. Off the foyer you'll find a dining room with tray ceiling that can easily accommodate a large group, making it perfect for holiday gatherings...The open and spacious living space is ideal for those who enjoy entertaining. Guests can easily flow from the living room to the open kitchen during soirees. Perfect for the budding home chef, the kitchen boasts BRAND NEW stainless steel appliances, generous sink, BRAND NEW subway tile backsplash, white cabinets, and countertops! Store all your favorite cooking appliances and dishes in the many kitchen cabinets. This home was certainly built with storage in mind! Near the kitchen you'll find a large laundry room and separate pantry. Downstairs you'll discover the divine master suite with BRAND NEW carpet, which overlooks the private backyard and Freedom Park. The spa-like master bath with dual vanities, glass shower, separate tub, is a true retreat and features a large walk-in closet. Upstairs you'll find the remaining three bedrooms each with its own spacious closet and shared bath. The large upstairs bonus room truly makes this home stand out! It will make a perfect playroom, office, music studio, or movie theatre. This extremely large room has endless possibilities! This charming home has plenty of outdoor living space including a welcoming front porch, relaxing rear screened-in porch, and a huge backyard.